#This study was funded by a research grant from the Greek Ministry of Education and the European Union, E.P.E.A.E.K., Action 2.2.3, (Code 87301), Dept. of Early Childhood Care & Education, ATEI Thessaloniki. Research Group of Archimedes Project: Evridiki Zachopoulou, , Efthimios Kioumourtzoglou, Elizana Polatou, Ioannis Papastathis, Chrisoula Melissa‐ Chalkiopoulou, Efthimios Trevlas, Megalonidou Christina, Elisavet Konstadinidou. The present paper discusses the eating habits, the personal hygiene rules and the physical activities of 192 parents and their children, aged 3â4. The research demonstrated that: a) As far as diet is concerned, the children/subjects were mostly following a Mediterranean type of diet, which involves meat, dairy products and legumes; however, they were consuming great quantities of sweets and small quantities of vegetables and fruits. b) As regards hygiene, the children were quite careful that the fruits and utensils they used were clean, but they were taking less care of washing their hands and brushing their teeth. c) Concerning physical activities, the children were involved mostly in vigorous activities, but they were also watching television on a daily basis.The differences among the subjects were identified in terms of: a) residence. The children living in advantaged areas were found to consume more fruits, which they washed first, and also washed their hands and brushed their teeth more frequently than the children who lived in depressed areas. b) gender. The girls played video games more than the boys, whereas the boys played with balls, or skippingrope, hulaâhoop etc. c) age. The children, aged four, were more receptive to advice about how to chew their food and played outdoor games more frequently than the children aged three and a half. d) weight. The overweight children participating in the research were found to eat more vegetables and the percentage of the parents who were not joining in children’s energyârequiring physical activities (bicycling, walking etc.) was smaller in comparison with the percentage. healthy eating habits, hygiene rules, physical activities, healthy habits, pre‐school age. Pre-school age is the most significant period in people’s lives, as far as all the stages of their growth are concerned. It is the age during which individuals become acquainted with behaviours, attitudes and values of their social environment and, through adults, become familiarized with the culture of the social group in which they grows up [Vygotsky, 1978]. The role of parents is particularly important during this primary socialization as parents are the first to teach their children how to adopt or reject rules and attitudes, with which children have primarily become familiar in their own family environment. Health‐related attitudes are the first to be communicated since, during pre‐school age, parents are very concerned with their children’s health. To ensure a healthy life, experts advise parents to care for a series of specific issues, such as vaccination, a secure and healthy place to live in, a healthy diet etc. As regards diet, nutritionists recommend that both children and adults should follow the Mediterranean type of diet. According to the dietary food pyramid of the Mediterranean type of diet, children aged 2‐6 require six portions of grains (rice, bread, pasta), three to four portions of vegetables, three to four portions of fruit and three or more portions of dairy products a day. They should also eat legumes once or two times a week, fish twice a week, chicken or meat once to three times a week and rarely fats and sugar [NIDDK Weight‐control Information Network, 2004; Medical Library, 2004]. Children should eat such kind of food in small and frequent meals, which must include limited quantities of saturated fat, reasonable quantities of salt, small quantities of sweets and plenty of vegetables and fruits [Zabellas, 2003]. Healthy eating habits require water, as well; children should drink water between and not during meals, so as to facilitate digestion [Zoubaneas & Manolarakis, 2002]. A good diet, in combination with physical activity, is fundamental for a child’s healthy and normal growth. In contrast, a bad diet in combination with less exercise, may lead to diseases, such as obesity. Obesity is the most frequent contemporary childhood “disease”. In European countries, the frequency of obesity has been increasing among people of various nationalities. In Great Britain, it was demonstrated that over a period of ten years (1982‐1993), the skin layer of the triceps was 4.5% thicker for boys and 2.9% for girls, depending on the children’s national origin [Johnson‐Down et al 1997]. Nowadays, in Western world countries, the percentage of obese children is higher than in any other period of time. In Greece, the fact that childhood obesity has been higher than adults’ obesity is particularly worrying [Kapantais, 2001]. In Crete, in the last thirty years, following a diet according to the western eating habits rather than the traditional Mediterranean type of diet has led to an increase in the frequency of obesity symptoms and of additional factors conducive to cardiovascular diseases [Kafatos et al, 1997]. On the other hand, a Mediterranean type of diet has led to a considerable decrease of heart attacks, as the results of a programme of secondary prevention demonstrated in France [De Lorgeril et al, 1999]. The high frequency of obesity symptoms, its long‐lasting duration and the difficulties involved during treatment have had physical and psychological effects both on individuals and their own environment [Chrysanthopoulos, 1999]. Research has demonstrated that obesity is associated with serious diseases during adult life (cardiovascular diseases, hypertension, diabetes 2) [Rajen, 1999], whereas the treatment of obesity based on drastic changes in a child’s eating habits may lead to anorexia nervosa and bulimia [Cheung, & Richmond, 1995]. The reason for the increase in obesity is rather complicated and is associated with genetic and social factors. Research tends to relate obesity to hereditary factors. It has, thus, been demonstrated that children with one parent who is obese are 40% more prone to obesity. The percentage increases to 80% when both parents are overweight. However, it has not been clear if this is due to a child’s hereditary propensity to store extra lipids or the eating habits and attitudes towards physical activity shared in a family [Westcoot, 2004]. Other research has demonstrated that the eating habits and lifestyles of families may be conducive to obesity [ΜcPherson, Stolley, & Dyer, 2002; Campbell, & Crawford, 2001; Finn et al, 2002]. Although obesity is a complicated issue, it can be prevented if specific dietary guidelines are implemented, so that children’s needs in calories are satisfied. It is also vital that children include physical activities in their programme, which should be adapted to their own abilities. Physical activities are effective not only for fighting but also for preventing obesity. In contemporary societies, lifestyles are based on the automation of many activities, the use of computers and the habit of watching television, which constrain physical activities both for adults and children. Research has demonstrated that the decrease of the percentage of young children taking up physical activities concurs with the increase in the frequency of using computers [Froberg, 2002]. Watching television is also conducive to childhood obesity as TV commercials prompt children to consume sweets, soft drinks and other unhealthy types of food [Canadian Institute of Child Health, 2000]. In addition, watching television is frequently accompanied with eating snacks, etc. The Canadian Pediatric Society recommends that families should control sedentary behaviour by limiting the amount of time that children spend watching television and video, or playing video games. The Society also suggests that parents should be positive role models for their children and choose activities that all family members can join [Canadian Pediatric Society, 2002]. In Canada, according to the set standards concerning children’s physical activities [Roths, 2002], it is recommended that the frequency of physical activities be increased to the minimum of 60 minutes a day, whereas daily vigorous activities should last at least 30 minutes, that is, physical activities should take 90 minutes every day. The specific guidelines do not clarify about the amount and type of activities suitable for pre‐school children during the various stages of their growth. According to NIDDK [Weight‐control Information Network, 2004], children should take up physical activities that last 60 minutes a day. The activities which are considered most suitable for pre‐school children are jogging, bicycling and dancing. Physical activities are valuable in many ways as, apart from being conducive to preventing obesity, taking up daily exercise helps bones, muscles and knuckles be stronger, prevents or delays high arterial pressure, fights stress and depression, boosts children’s self‐confidence and, through its effect on mental health, it contributes to enhancing children’s ability to learn [Sanders, 2005]. To ensure children’s healthy growth, it is not recommended that children only follow a healthy diet and take exercise. It is also required that they follow healthcare rules so that the possibility of a disease would be reduced. A fundamental rule related to diet is that children should chew their food carefully, firstly, because they run the risk of choking over their food, secondly, because swallowing food hastily makes digestion difficult, and, thirdly, because the brain must have the time to send the message that the stomach is full, and, therefore, superfluous food intake can be avoided [Zoubaneas, & Manolarakis, 2002]. In addition, diet is directly associated with dental health. Since 1965, it has been demonstrated that dental problems are epidemic and the necessity of dental care has been emphasized during the period of childhood. It has been observed that at the age of two, about 8% of the children suffer from tooth decay in one or more teeth and the percentage comes to about 60% at the age of three [Papadatos, 2000]. Tooth decay has been the greatest problem for the children at pre‐school age. Decay is deteriorated by deficiency in fluorine, the excessive consumption of sweets, medicines, the use of bottle feeding for liquid food (milk, juice) before bed time, and also poor dental care [Chrysanthopoulos, 1999]. To protect their teeth, pre‐school children should brush them every day. Children should get their own toothbrushes when they are two years old. Tooth brushing, however, is effective only when parents attend their children while brushing their teeth until the age of eight. Parents should attend tooth brushing at least before bed time, which is considered necessary, as during that time, the amount and quality of saliva secretion changes. However, it is recommended that, to protect children’s dental health, parents should train them at a very early age so that they include dental care in their daily routines. Finally, to protect children from infectious diseases, it is essential that hygiene rules be kept for cooking utensils and hands, which must be washed meticulously. According to the American Prevention and Control Centre, it is vital that people wash their hands frequently as this is the best course of action to deter infectious diseases, which inflict mostly children, who tend to put their hands in their mouth, nose or eyes. In addition, hygiene rules are considered evidence of civilized manners, which make people’s social lives easier. Thus, learning and following the fundamental rules contributes to children’s social development, as well. c) the physical activities of young children. In the present research the participants were 222 nursery school children, who live in Thessaloniki, and their parents. The research was based on stratified sampling based on residence and type of nursery school. In detail, the investigation was carried out in five municipal nursery schools in eastern Thessaloniki, two in western Thessaloniki, and two municipal and three private nursery schools in the suburbs. Data collection was based on a questionnaire which was answered by the participating parents. On the basis of the relevant bibliographical references, three specific aspects of healthy life were selected, that is, diet, hygiene and physical activities. Subsequently, the choice of the final questions was made with a view to enabling the assessment of the considerations at issue, and a pilot questionnaire with 30 questions was distributed to 30 parents, whose children were at a nursery school. On the basis of the observations and the difficulties confronted when the questionnaires were completed, and according to the experts’ views, as far as healthcare behaviour is concerned, questions which were similar to others were omitted and unintelligible phrases were reworded. Thus, the final questionnaire was comprised of 22 questions, 9 of which are related to diet, 6 hygiene and 7 physical activities. 192 questionnaires were completed by192 parents with children, aged 3‐4. Of the children participating in the research, 106 were boys and 86 were girls, 39 were at nursery schools in rather depressed areas and 153 in nursery schools in privileged areas. On the basis of father’s profession, the children belonged to the middle social class. Father’s profession: 57 self‐employed, 56 civil servants, 60 employees in a private company, 2 unemployed, 17 did not answer. Mother’s profession: 21 self‐employed, 74 civil servants, 62 employees in a private company, 21 unemployed, 14 did not answer. The statistic analysis was made on the basis of SPSS 11.5 and includes: a) frequency statistics, b) cross‐tabulation statistics with statistical indicators (chi‐square, degrees of freedom, significance of value). The significance level was p<=0.05. Table 1 demonstrates that the majority of the participating pre‐school children eat meat at least three times a week (60.7%), legumes once a week (58%) and dairy products at least three times a week (62%). They also drink three or more than three glasses of water a day (71.3%), and do not drink soft drinks (51.1%). However, there is a percentage of children who eat meat once a week (12.6%) and no legumes (9.4%). In addition, the majority of the children eat cereals once or twice a day (61.4%), they never eat vegetables or they eat only vegetables once a week (60.9%) and they never eat fruits or they eat fruits only once a week (55.8%). 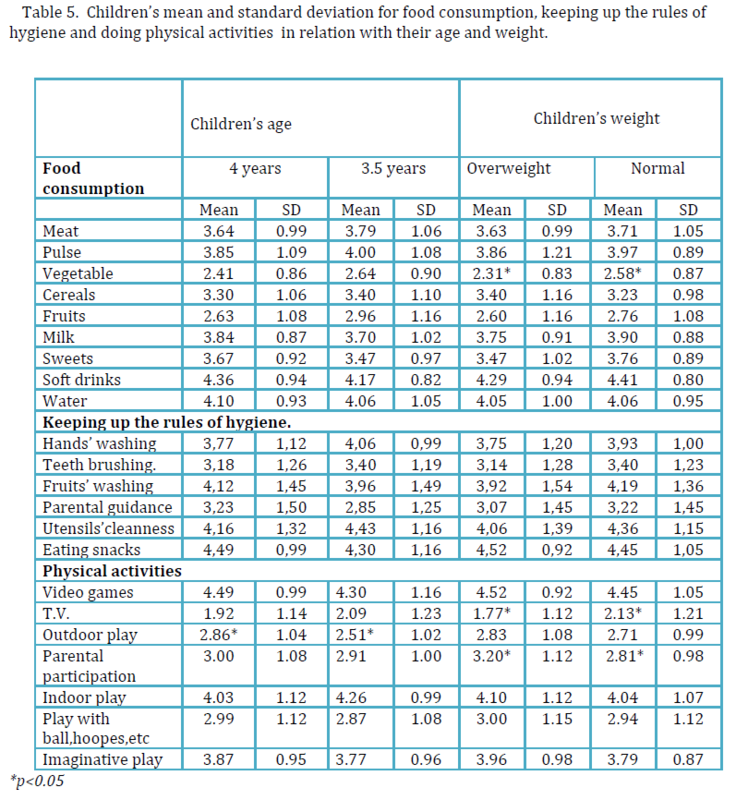 The comparison of means indicated that overweight children consume more vegetables than the children with normal weight (t=‐2.097<0.05) (Table 5) and that the children who lived in depressed areas consume considerably smaller quantities of fruits than the children in advantaged areas (t=2.038<0.05) (Table 4). As far as sweets and soft drinks are concerned, most children eat one sweet per day (56.3%) and do not drink soft drinks (51.1%). The percentage of the children who eat three or more sweets a day is high (12.4%). 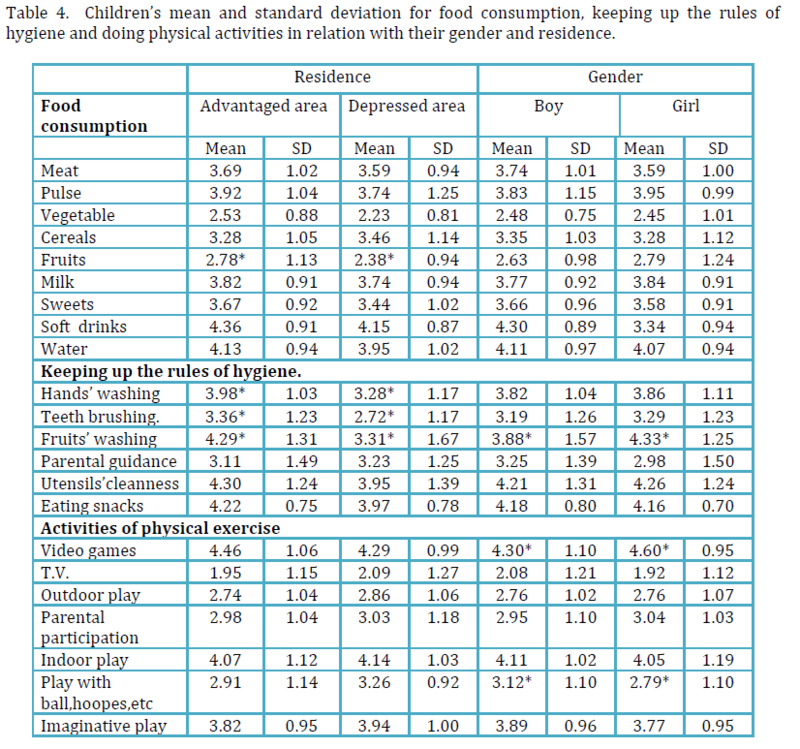 1. children’s gender and consumption of vegetables (x2 =11.538, ΒΕ =4, ρ<0.05) and fruits (x2 =12.183, ΒΕ =4, ρ<0.05). The girls eat vegetables and fruits more frequently than boys. 2. children’s residence and the consumption of sweets (x2=9.653, ΒΕ=4, ρ=0.05) and soft drinks (x2=11.836, ΒΕ=4, ρ<0.05). The number of the children who live in depressed areas and eat two or more than two sweets a day or drink two or more than two soft drinks is higher than that in advantaged areas. 3. children’s age and the consumption of dairy products (x2 =9.172, BE =3, p<0.05). On a daily basis, four‐year‐old children consume dairy products more frequently than the children aged 3.5. 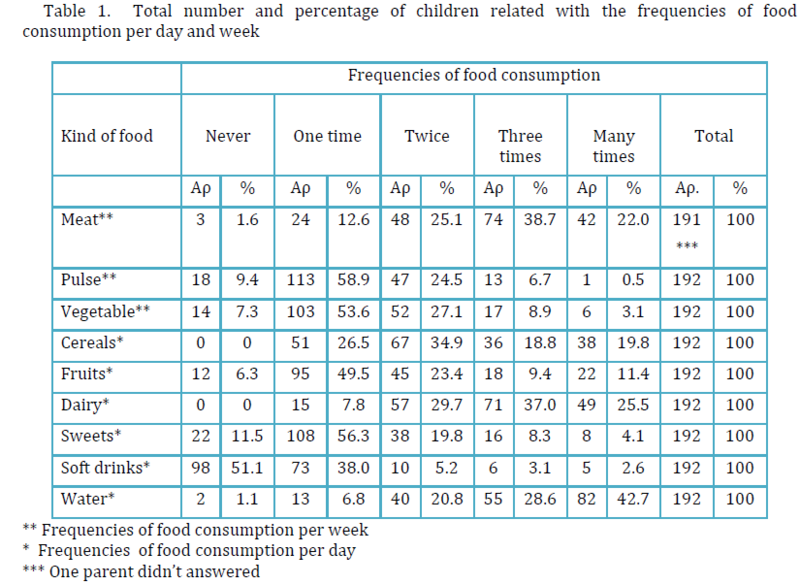 Table 2 demonstrates that most of the participating children always wash their fresh fruits before they eat them (67.7%), they avoid using dirty utensils (66.9%) and they rarely or never eat snacks when they watch television (83.8%), whereas most mothers advise their children to chew their food well (64.4%). However, there is a high percentage of mothers (35.6%) who do not advise or rarely advise their children to chew their food well. The percentage of children who always wash their hands after they use the toilet and before meals and they brush their teeth every day is relatively low (37% and 20% respectively). 1) age and how often mothers advise children to chew their food well (x2 =12.982, BE =4, p<0.05). Mothers advise four‐year‐old children to chew their food well more often than children who are 3.5 years old. In depressed areas, in contrast to advantaged ones, children tend to wash their hands and fruits less frequently, they rarely brush their teeth and they often eat snacks while watching television; also, mothers tend to advise children to chew their food well less frequently. The comparison of means demonstrated that girls wash the fruits they eat more frequently than boys (t =‐2.178<0.05) and that children in depressed areas wash their hands (t=3.678<0.05) and fruits (t=3.408<0.05) by far less frequently; they also brush their teeth more rarely (t=2.954<0.05) than the children who live in depressed areas (Table 4). 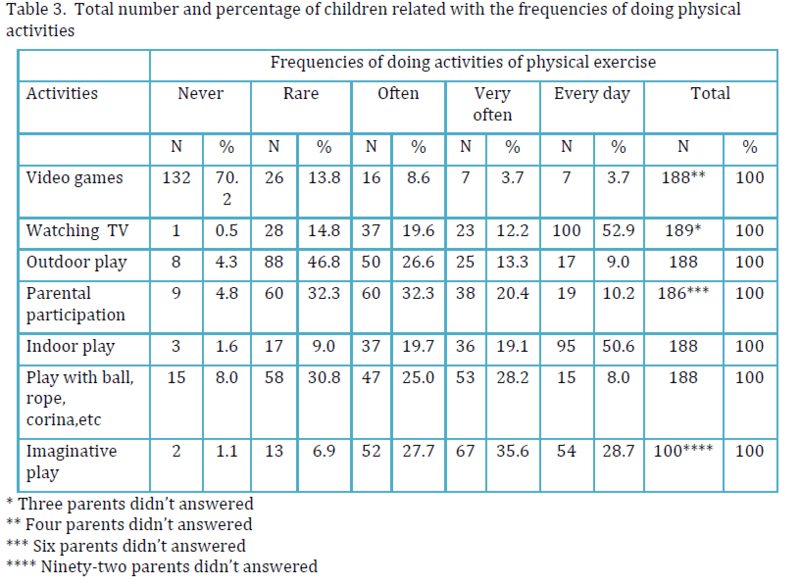 Table 3 demonstrates that the majority of pre‐school children play vigorous games at home (50.6%), they very often play with balls, hula hoops, jump rope, etc. (61.2%) and they very often improvise and play imaginary vigorous games (64.3%). On the other hand, most children never play video games (70.2%), but they watch television on a daily basis (52.9%) and they rarely play in parks and playgrounds (51.1%). The percentage of children who rarely play with balls, hula hoops etc. and of the parents who rarely take part in the vigorous activities of their children is high (38.8% and 37.1% respectively). Significant relations were observed when the results were analyzed in terms of children’s gender and watching television (x2 =11.587, ΒΕ =4, ρ<0.05). Girls watch television more frequently than boys. The comparison of means demonstrated that overweight children watch television more than children with normal weight (t =‐1.992<0.05), that parents who have children with normal weight join in their children’s vigorous games more than parents with overweight children (t=2.359<0.05), that four‐year‐old children play outdoors more than children who are 3.5 years old (t=1.979<0.05) (Table 5) and that girls play video games more than boys (t=‐1.986<0.05), whereas boys play with balls, hula hoops, etc. more than girls (t=2.100<0.05) (Table 4). Healthy attitudes, established in one’s early period of life, are more likely to be followed later, in adult life, as well. Pre‐school age is an ideal period to establish healthy eating habits for life, firstly, because parents can control their children’s diet and by means of communicating healthy diet knowledge they can guide their children to develop positive attitudes towards a healthy diet, and, secondly, because dietary practices change as children grow up (e.g. meals at school); thus, eating habits which have not been established during early childhood can change when they are affected by non‐family factors [St. Jeor et al, 2002]. Research has demonstrated that children’s dietary attitudes are affected by parents’ eating preferences and ideas [Stockmyer, 2001] and that the quality of children’s diet at the age of 3‐5 is affected primarily by the eating habits of the parents [Oliverie et al, 1992]. Given that, for the last few decades of the 20th century Greek people have been following the western type of life and diet, it is most likely that Greek children do not adequately follow the patterns of the Mediterranean type of diet. More specifically, Greek pre‐school children consume plenty of meat, legumes and dairy products, but they eat many sweets and small quantities of grains, fruits and vegetables. Small quantities of fruits and vegetables are also consumed by Greek children at school age [Papadelis et al, 2002], as well as by children in the USA and Canada [American Dietetic Association, 1999; Heart and Stroke Foundation, 1998]. In Greece, especially children who live in depressed areas consume by far smaller quantities of fruits than children who live in advantaged areas. Thus, in combination with the negative relation between eating fruits and eating sweets (r= ‐ 0.204<0.01), it is advocated that socially or physically underprivileged children are susceptible to an unhealthy diet [Froberg, 2002; McPherson et al, 1995]. In the specific sample, there is no significant variation in children’s diet in terms of gender and age. However, it has been observed that overweight children normally eat more vegetables than children with normal weight (t =‐2.097<0.05), probably because they generally eat more. In addition, girls eat vegetables more frequently than boys, probably because they would like to resemble their mothers who take care of their weight and body. Finally, four‐year‐old children eat more dairy products than children at the age of 3.5. The positive relation between eating meat and also vegetables (r =0.151<0.05), fruits (r =0.197<0.01) and dairy products (r =0.226<0.01) possibly indicates that Greek parents are concerned with establishing a balanced diet for their children, as regards consuming animal or vegetable food. A healthy diet and hygiene are components of a child’s good health. By providing the appropriate nutrients, the former ensures a healthy physical growth and, by preventing diseases, the latter ensures a child’s good health. Most of the fundamental hygiene rules, which children have to learn and comply with, are related to one’s personal hygiene (washing hands, brushing teeth) [Greek Ministry of Inner Affairs, Governmental Paper, 2002] and also to washing food and utensils. In the present research sample, most children wash the fruits they eat and the utensils they use, probably because their mothers urge them to do so, but they are not concerned with their personal hygiene, and, in particular, with washing hands after they use the toilet and before meals, and also with brushing teeth. Children in depressed areas do not frequently comply with hygiene rules, as they wash their hands and fruits and brush their teeth less frequently than children who live in advantaged areas. It is very likely that this has serious consequences to children’s dental health (i.e. tooth decay). In general terms, not following the appropriate hygiene rules makes children more prone to infectious diseases and vice versa. Research has demonstrated that washing hands regularly is an effective way to protect children from diseases as it prevents diseases from being spread in schools [Niffenegger, 1997]. Recently, the contribution of physical activities to a healthy life has been strongly emphasized. Frequently, tips and guidelines are addressed to adults who rarely take up physical activities. Decreased energy levels are normal during adult life; however, when getting older is combined with modern lifestyles (sedentary life, not walking regularly etc. ), physical activities are worryingly decreased, so that people have to join in organized energy‐requiring activities in order to maintain a health life. Research has demonstrated that taking up various vigorous activities or sports during early childhood predisposes people towards taking up sports and physical activities during adolescence and adult life [Ηorn, & Harris, 1996; Weiss, & Ebbeck, 1996]. During pre‐school age, the levels of physical activities are normally high, as young children are naturally energetic. They tend to always move, exploring their environment, playing and, overall, feeling happy. In the sample of the present research, most children play vigorous games at home every day, but rarely in playgrounds and parks. As regards young children’s relationship with modern technologies, most children do not play video games, but they watch television on a daily basis. There is a negative relation between playing outdoor games and watching television (r =‐0.163<0.05), which may be interpreted as evidence corroborating the fact that keeping children at home is one of the reasons that makes children watch television, which results in various serious consequences. Many studies have demonstrated that watching television is conducive to an increase in children’s weight and childhood obesity as children tend to eat snacks while watching. The present research demonstrates that overweight children watch television more than children with normal weight (t=‐1.992<0.05) and that there is a positive relation between watching television and eating snacks (r=0.146<0.05). It was also demonstrated that parents with children with normal weight join in their children’s vigorous activities (walks, bicycling, games with balls) more frequently than parents with overweight children (t =2.359<0.05), which, apart from any benefits to the physical and emotional development of children, also contributes to a child’s long‐term state of health, as parents’ attitudes direct a child towards taking up physical activities during adult life [Kohl, & Hobb, 1998]. Nowadays, childhood obesity tends to become epidemic and be considered a social problem, as being obese is often associated with other factors negatively affecting people’s health [Kouritis et al, 2000; Kafatos, 2004]. A research carried out in Crete [Kafatos, 2004] investigated 1271 pre‐school children’s health and it was demonstrated that 30% of the children were overweight, had increased levels of cholesterol and anaemia, which was attributed to great amounts of saturated fat, manufactured products and the insensible intake of sweet soft drinks. It is, therefore, imperative that children be prompted to establish healthy eating habits and follow a naturally energetic lifestyle even during early childhood. The specific need derives from the fact that, as children grow up, healthy eating habits and physical activities are increased [Canadian Pediatric Society, 2002; King, 1999; Heart and Stroke Foundation, 1998]. The responsibility for a healthy life for children belongs, first, to parents and later to teachers and the general public. The Greek state, in an attempt to ensure and promote citizens’ health, has enacted laws for applying healthcare programmes even in pre‐school institutions (Nursery schools, Kindergartens) [Greek Ministry of Education, Governmental Paper, 2001; Melissa‐Halikiopoulou & Natsiopoulou, 2005]. The co‐operation of parents and teachers is essential in order for healthy habits to be established and unhealthy ones to be avoided so that children’s health and quality of life could be ensured in the future. The results of the present research are suggestive and should not be interpreted as typical of young children’s lifestyles in Greece on account of the fact that the research sample was rather small, all the participating parents were city‐dwellers, they were middle or high class and their educational status was mostly high. To obtain an overall picture concerning Greek children’s healthy lifestyles, further research is required, which would involve participants from various urban areas and of different educational and social status. It is our major concern and it would be our great pleasure to encourage further research into children and adults’ quality of life. 1. American Dietetic Association Dietary guidance for healthy children aged 2 to 11 years‐Position of ADA. J Am Diet Assoc 1999, 99, 93‐101. 2. Campbell, K., & Crawford, D. Family food environments as determinants of preschool‐aged children’s eating behaviours; implications for obesity prevention policy. A Review: Aust J Nutr Diet 2001, 58,19‐25. 3. Canadian Pediatric Society. Healthy active living for children and youth‐Position Statement. Pediatric Child Health 2002, 7(5), 339‐345. 4. Canadian Institute of Child Health. The Health of Canada's Children. Ottawa, Third Edition 2000. 5. Cheung, L.W.Y., & Richmond, J. B. Child Health, Nutrition and Physical Activity. USA: Human Kinetics 1995. 6. Chrysanthopoulos Ch. Pediatric Primary Health Care. Thessaloniki, Creece 1999..
7. De Lorgeril, M., Salen, P., Martin, JL, Monjaud, I., Delaye, J., & Memelle, N. Mediterranean diet, traditional risk factors, and the rate of cardiovascular complications after myocardial infarction. Circulation 1999, 99, 779‐85. 8. Finn, K., Johannsen, N., & Specker, B. Factors associated with physical activity in preschool children. J Pediatr 2002, 140, 81‐5. 9. Froberg, K.. Trends about physical activity, physical situation and obesity of children and young people in European Countries with special reference in Denmark. Unpublished paper presented in a Conference organized by the Institute of Athletic Studies and Education with the title: Child, Physical exercise and Health. Thessaloniki 2002. 10. Greek Ministry of Education, Governmental Paper No 1376 Interdisciplinary Unified Framework Programme of Education for Kindergarten 2001. 13. Horn, T.S., & Harris, A.. Perceived competence in young athletes; research findings and Recommendations for coaches and parents. In F. Smoll & R.E. Smith (Eds). Children and Youth and Sport. A Biopsychosocial perspective 1996 (pp. 309‐329). Brown and Benchmark, Madison, WI. 14. Johnson‐Down, L., O’Loughlin, J., Koski, K.G., & Gray‐Donald, K. High prevalence of obesity in low income and multiethnic schoolchildren: A diet and physical activity assessment. Journal of Nutrition 1997, 127, 2310‐2315. 15. Kapantais E. Child’s obesity. 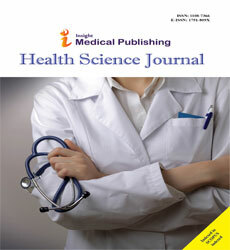 http://Health.in.gr/news/article.asp?arcode=4410 2001. 16. Kafatos A. Bad nutritional habits of infant children. <http//www.health.in.gr/> 2004. 17. Kafatos, A., Diacatou, A., Voukiklaris, G., Nikolakakis, N., Vlachonikolis, J., & Kounali, D. Heart disease risk‐factors status and dietary changes in the Cretan population over the past 30 y: the seven countries study. American Journal of Clinical Nutrition 1997, 65, 1882‐6. 19. Kohl, H., & Hobb, K.E. Development of physical activity among children and adolescents. Pediatrics 1998 ,101, 549‐555. 20. Kouritis G.,Tornaritis M., Savvas X.S., Hatzigeorgiou Ch. & Siamounki M.. The obesity of children aged 11‐12 years in Cyprus: Important increasment during the last 8 years. Peadiatric 2000,. 63, 137‐144. 21. McPherson, R.S., Montgomery, D.H., & Nichaman, M.Z]. Nutritional Status of Children; what do we know? J Nutrition Education. 1995, 27(5), 225‐234. 23. Melissa‐Halikiopoulou, Ch., & Natsiopoulou, T. . Health education in Greek preschool settings. The importance of reading children’s books on health promotion. ICUS NURS WEB J 2005, 24, 1‐ 7. 25. Niffenegger, P. J. Proper handwashing promotes welness in child care. J Pediatric Health Care 1997, 11, 26‐31. 26. Oliverie, S.A., Ellison, R.D., & Moore, L.L.. Parent‐child relationships in nutrient intake; the Framingham Children’s Study. Am J Clin Nutr 1992, 56(3), 593‐598. 28. Papadelis L., Papastergiou E., & Papadeli Ch.. Nutritional habits and hygiene attitudes of children 8 years of age. Unpublished paper presended in the 14th Panhellenic Congress of Greek Society of Social Peadiatric and Health Promotion, Thessaloniki, 23‐25 May 2002. 29. Rajen, S. Α.. Profile of Overweight Children. Nutrition Insights 1999, 5(13). 30. Roths, B.. Let’s Move, Learn, and Have Fun! Gem No. 356 J Nutr Educ Behav 2002, 34, 343‐344. 32. St. Jeor, S.T., Perumean‐Chaney, S., & Sigman‐Grant, M. Family‐based interventions for the treatment of childhood obesity. J Am Diet Assoc 2002, 5, 640‐644. 33. Stockmyer, C. Remember when mom wanted you home for dinner? Nutr Rev 2001, 59(2), 57‐60. (pp. 364‐382). Oxford Blackwell Science. Osney mead. 36. Westcoot P. Healthy nutrition for babies and infants. Greek interpretion by B. Kantzola‐ Sabatakou, Athens: Minoas 2004. 37. Zampellas A. . Nutrition during the phases of life. Athens: Medical Editions Paschalidis 2003.